(Nanowerk Spotlight) Sensors have evolved from simple measuring tools to smart appliances that are connected through the internet to the cloud and to each other. At the recent ISSCC-conference, researchers from imec & Holst Centre have presented a number of remarkable developments. These may pave the way to a world where sensors assist us to drive more safely, live healthier, and make the planet more sustainable. Ubiquitous sensors will make their mark in many domains—smart buildings, self-driving cars and automated industrial and logistic processes to name a few. And, essential for a more sustainable future, sensors will be of great help to tackle environmental issues. If we are able to measure the quality of air and water continuously and in a fine-grained way, and we can collect the data centrally, it may be possible to take better-directed actions, and immediately measure the results. One of the possibilities is sensor fusion: measuring the same physical parameter with a number of different sensors (e.g. someone’s heartbeat that can be monitored electrically, optically and even acoustically). By combining the results of the sensors and interpreting the result, it is possible to arrive at a robust and reliable result. Context awareness could also be added. For example, a sensor that ‘feels’ a person has started sleeping communicates this result to a second sensor that has the task to monitor the heart at rest so one sensor flags the ideal moment for the other sensor to start work. At ISSCC, researcher Mario Konijnenburg from Holst Centre/imec presented some remarkable results. Together with a colleague, he developed a chip that is able to measure several body parameters at the same time: an electrocardiogram (ECG), bio-impedance (BIO-Z, electrical conductivity of the body revealing the composition of body tissues), galvanic skin response (GSR, changes in the electrical properties of the skin due to e.g. stress), and photoplethysmogram (PPG, changes in the blood circulation in tissues due to changing light absorption). 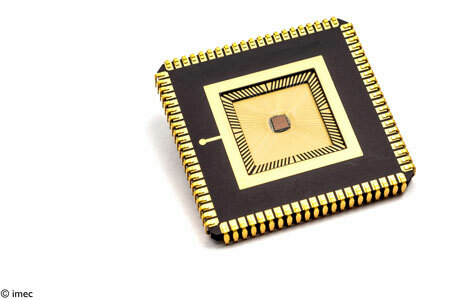 Because these data are collected on one chip, it is perfectly possible to synchronize them and look for correlations. In this example, the combination of measurements allows for a reliable way to deduce heartbeat and heart rate variability while (relative) blood pressure can be deduced by interpreting the ECG- and PPG measurements. 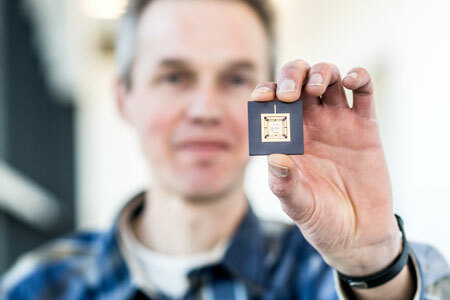 Mario Konijnenburg with his multi-sensor chip. At ISSCC, imec researcher Pamula Venkata Rajesh showed a readout chip for photoplethysmogram measurements (PPG) based on LED-light and using compressive sampling. The PPG results deduce both heart beat and heart rate variability. They are a nice alternative for ECG monitoring because they don’t require the use of electrodes on the patient’s chest. The downside is the sensor’s LED light that shines through the skin needing additional energy, which is a serious drain on the energy budget of the small sensor chip. Therefore, it is important that the measurements can be done with compressive sampling, measuring less but smarter data points. By Nick Van Helleputte. Nick received his MS degree in electrical engineering in 2004 from the Katholieke Universiteit Leuven, Belgium. He received his Ph.D. degree from the same institute in 2009 (MICAS research group). His PhD research focused on low-power ultra-wide-band analog front-end receivers for ranging applications. He joined imec in 2009 as an Analog R&D Design Engineer. He initially worked in the space and extreme electronics group working on among others ESA projects and design of radiation hard, space-grade ASICs. He later moved to the biomedical circuits and systems design team which he is currently leading. 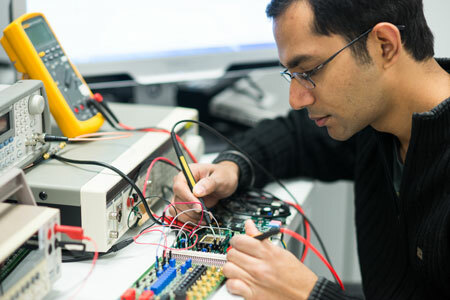 His research focus is on ultra-low-power circuits for biomedical applications. He has been involved in analog and mixed-signal ASIC design for wearable and implantable applications. Nick is an IEEE member and served on the technical program committee of VLSI circuits symposium.